The basic national policy of Japan is to dispose high-level radioactive waste in the deep underground after extracting usable uranium and plutonium from spent fuel. The Horonobe Underground Research Center conducts research and development on geological disposal of high-level radioactive waste and geoscientific research to verify the technical reliability of geological disposal through testing and research conducted in actual deep geological environments. The Horonobe Underground Research Center carries out research and development on geoscientific study and on geological disposal for high-level radioactive waste. The Horonobe Underground Research Laboratory (Horonobe URL) project of the Japan Atomic Energy Agency (JAEA) planned at Horonobe-cho in northern Hokkaido. The Horonobe URL is one of the underground research laboratories stated in the "Long-term Program on Research, Development and Utilization of Nuclear Energy (LTP)", and aims to study the deep geological environment in sedimentary rocks. The importance of the underground research laboratories is stated in the revised LTP as providing sites for research and development to confirm geological disposal technologies and to establish safety assessment methodologies, and also serving as a facility for the public to learn about geological disposal. The Horonobe URL project is to carry out two major researches: "Geoscientific Research," a scientific study of the deep geological environment, and "Research and Development on Geological Disposal" for improvement of reliability on the geological disposal technologies and advancement of safety assessment methodologies. The Horonobe URL project is planned over a period of 20 years, with investigations conducted in three phases. Phase 1: surface-based investigations (6 years). Phase 2: investigations during construction of the underground facility (6 years). Phase 3: investigations using the facility (9 to 11 years). There are some overlaps between these phases, and the terms are subject to change according to the progress of the project. The Horonobe URL project aims to confirm the scientific and technical basis for geological disposal as presented in the "H12: Project to Establish the Scientific and Technical Basis for HLW Disposal in Japan - Second Progress Report on Research and Development for the Geological Disposal of HLW in Japan -" through investigations of the actual deep geological environment in sedimentary rocks. The results contribute to the formation of the geological disposal program of the implementing organization and to the safety regulation by the government. 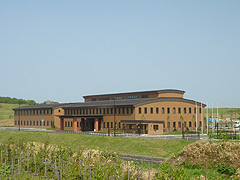 They are to be considered together with the results of the geoscientific research conducted at the JAEA Tono Geoscience Center in Gifu Prefecture, the research and development on geological disposal at the JAEA Tokai Research and Development Center in Ibaraki Prefecture, and with results obtained from international cooperative studies. Another important role of the Horonobe URL is to enhance public understanding toward the deep geological environment and HLW disposal by visiting the investigation sites and actually being exposed to the deep underground. Copyright © 2005 Japan Atomic Energy Agency. All rights reserved.